CROWN HEIGHTS — In the latest campaign to prevent youth gun violence in Crown Heights, the medium is cheeky — but the message is dead serious. Teens with Youth Organizing to Save Our Streets are encouraging their peers to take "selfie" photos alongside messages of peace and holiday decorations the group installed in storefronts along Kingston Avenue. The teens can then post the photos to Instagram, taking the anti-gun violence campaign online. "This year we had the idea to incorporate a social media campaign and capitalize on how much people like to take pictures of themselves," program coordinator Ruby-Beth Buitekant said of the project, which installed reflective panels alongside the snowmen and positive messages in local shop windows. "We hope that people will stop and take a selfie in the reflective surface and post it up." Each storefront "mirror" shows the campaign's hashtag, #selfies4safety, as well as messages like "I <3 Crown Heights" and "I Am a Peacemaker," in an effort to improve safety in a neighborhood long plagued by shootings. "I take a lot of selfies," said 16-year-old organizer Alexandria Pierre, who joined the group after losing a cousin to gun violence last year. "I haven’t taken any in the windows yet, because I had to see which windows I like best." When it comes to fighting the kind of violence that touched her family, Pierre has few tools at her disposal — some acrylic paints, foam brushes and a handful of paper snowflakes. 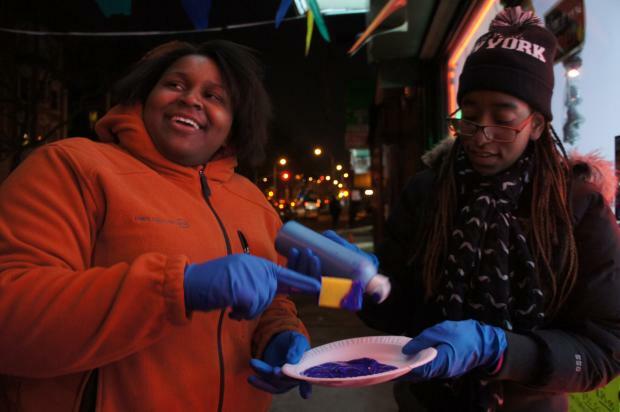 But she and her friends seemed unfazed by the cold weather or the sometimes chilly reception on Kingston Avenue on a recent evening, as they worked to recruit merchants to their cause and decorated the windows of those who agreed. "The youth organizers do the recruiting," Buitekant said. "They go into the stores themselves — staff doesn’t go with them, so they have to work hard to be taken seriously." Despite a few yeses that turned into nos, the teens were all smiles as they decked the dark avenue. "It's to unite the community, make it look nice and wish everybody a nice holiday," said 16-year-old participant Jocelyn Hart. "[Hopefully] they’ll be like, 'Oh wait, I can see myself,' and take a photo."